We finished up the Independence assignment this week over in the forums. We saw a lot of different ways to interpret independence, and because of the holidays, we also saw a lot of fireworks shots this week. However, the shots that really stood out to our judges were ones that evoked a feeling of independence, and in all of our choices, it turned out to include a human element. Our winner this week was unmnorth‘s self portrait. As he describes it “As a photographer, independence means self portrait! 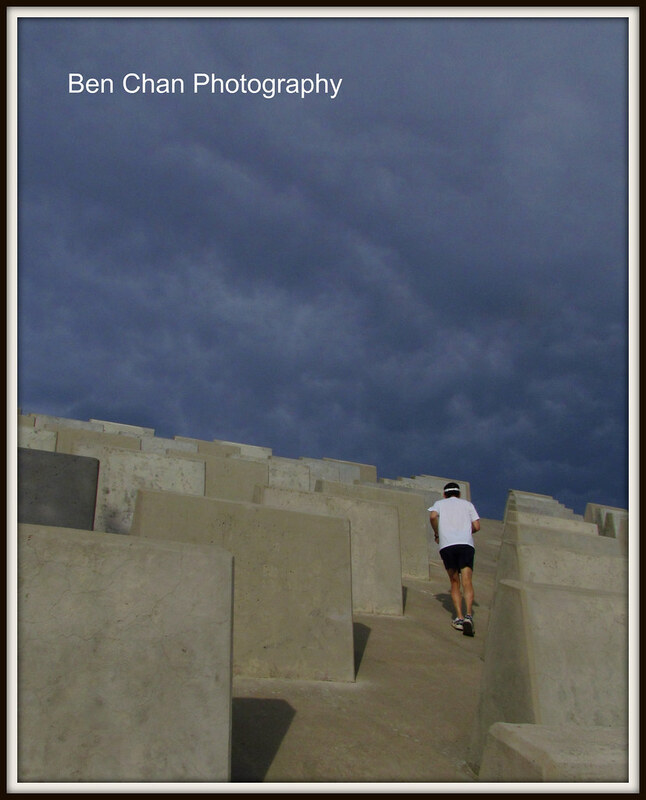 As an athlete, running is independence” and that description really stood out to our judges, along with the photograph. The dramatic dark sky contrasting with the cement steps (along with the subject along a diagonal line) really pulls your eye into the scene. Our first runner up was droidgirl‘s Freedom. As she said in her description, “Independence is – freedom from pants”. One judge described this photo in a single word: “Awesome”. It seems to tell a rather unique, if not somewhat funny story, and the vintage / aged sort of tones in the photo really work well here. And last, but not least was heartmysony‘s “Baby’s steps to independence”. They grow up quick enough, and the way that the baby is moving away from the camera really suggests that she’s trying to find hew own way. It’s a really cute photo that also emphasises that idea of independence. We started our newest assignment this week, focusing on Cinematic Widescreen. This assignment presents you with a triple challenge. First, there is the technical requirement that your photos be cropped in a 16:9 aspect ratio. Second, there is the conceptual challenge of trying to pick a scene that looks like it could have come from a film. Finally, there is the extra challenge of suggesting a title for the movie you have in mind. And if that’s not enough, a quick rundown of our usual assignment rules. First, your photo must have been taken between 6-20 July 2011. Second, your post must include the words “Cinematic Widescreen” and the date the picture was taken. Finally, your EXIF should be intact, and it’s helpful if you can include some of the main points, such as camera, lens, aperture, shutter speed, ISO, etc. For those lucky enough to be in the northern hemisphere and enjoying summer right now, “Leisure” is almost certainly on their minds, and that’s why it’s our next assignment. We want to know what defines leisure for you. Keep in mind, you need to put some work into your leisure assignment and think about the rules of composition and lighting and not just take a snapshot. Above all, try to make it interesting. We all know how deadly dull looking at someone’s vacation and family snaps can be, so give us a reason to look at your images. getting out of a photography rut, there was talk about looking at the work of others to find things that inspire you. This topic also came up in the forums recently. So where do you go to see pictures that inspire you? Come check out the list on the forums and add your own suggestions too. Whom to Please? : One forum member asked about the different reactions that you get when you show different people your photos, and that brought up the question of who should you please when you’re trying to take photos? Should it be you? Your audience, someone else? Come share your thoughts and join the discussion over on the forums. Wedding Dress Code: This is a thread that’s been around on the forums for a little while, but it still asks a good question: what is appropriate to wear as a wedding photographer? Come share your thoughts with us on the forums. Enjoyable and provoking photographs displaying talent and excellent interpretation. Disappointing to hear that a judge had such a limited vocabulary.